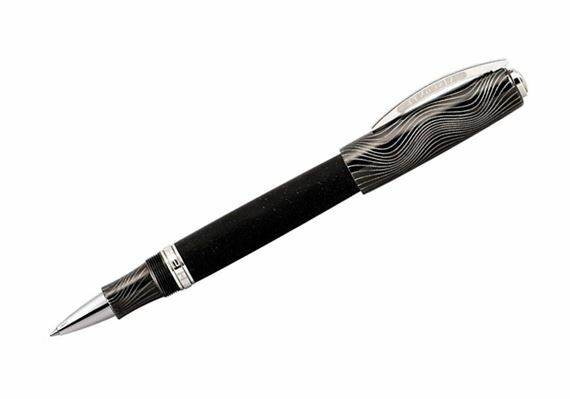 Order your Visconti Limited Editon Homo Sapiens Evolution Rollerball today from FahrneysPens.com. Fine Pens, Refills & Luxurious Gifts – great prices & fast shipping. Visconti presents the new Evolution, the latest addition to its iconic Homo Sapiens series. The Evolution combines the same unique volcanic lava material used to make the original Homo Sapiens with a specially- designed cap and grip crafted in Galvanized steel. The Evolution fountain pen is equipped with Visconti’s new and exclusive Skeleton nib, giving a modern face-lift to the classic design. Extracted from the Mt. Etna volcano in Sicily, the unique lava possesses special qualities that make it the perfect material for writing instruments: it's virtually indestructible; extremely comfortable and warm to the touch; and its hygroscopic properties absorb moisture from your hand. The engraved wave pattern on the cap, grip and blind cap creates a beautiful symmetry when the threaded cap is closed. The Evolution fountain pen has a vacuum power filler made of titanium to resist ink corrosion and features the much-anticipated Visconti Chromium 18 Skeleton nib. The nib’s special shape with customized grooves and cuts in Chromium 18 offers enhanced air and ink flow for exceptional writing. The Homo Sapiens Evolution also comes in a capped rollerball.